The Hazel Brook Reservation is 48 acres of conservation land owned by the Sudbury Valley Trustees, but it is adjacent to the Ogilvie Town Forest in Weston and conservation land in the town of Lincoln, creating over 65 miles of connected trails. This area is also just northeast of the Upper Mill Brook Conservation Area. 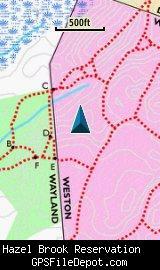 This KMZ map is set to Draw Order 32 so it will show 'beneath' your primary map on your Garmin KMZ-compatible GPS. In addition, this KMZ map is designed to show 'beneath' my adjacent KMZ map of the Upper Mill Brook Reservation. 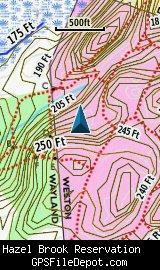 If both maps are loaded on your GPSr, the only part of the Hazel Brook KMZ that is obscured by the Upper Mill Brook KMZ is the legend of the Hazel Brook map.